Today we'll look at the four most popular printing techniques for wedding invitations. I've outlined the process of each and given a few tips about design and cost. Quantity, design choice, paper selections and printing technique are the main factors when determining cost. Price can also vary greatly between designers, especially now that invitation trends have moved in the direction of combining beauty with functionality. Your invitation suite will be like a little work of art and will give your guests their first taste of the wonderful day to come. Engraved invitations will give the most traditional look. It has also been a staple in wedding stationery for decades. Abby Jean and Louella Press are my favorites. So beautiful I can't stand it! Exquisite lines and decadent detailing, one look and it's love! The process is fairly labor intensive. Engravers etch lettering into metal plates. Ink is sunk into the depressions in the plates and loaded into a specialized printing press. The paper is pressed into the plate and the ink sits on the surface, creating the raised lettering. Engraving's signature feature is the bruising that occurs, like a halo around the lettering on the paper. This is a desirable effect and speaks to the beauty of the overall look. The bruise is caused as the paper is pressed against the plate. Inks used for engraving are opaque and unique to the process. An array of colors are available including metallic and white. For the bride looking for a twist on tradition, try printing bold, vibrant colors on darker stock. Get ready for a long turnaround, typically 4 to 6 weeks. Some designers can get it back faster, but not by much. This is a standard technique used for most printed material. Maps, books, music, the sky's the limit! This process allows for the most flexibility in color palette and design. A smart, modern design can make offset invites look even more beautiful. The Wiley Valentine design team uses a combination of offset printing and letterpress grade papers to achieve stunning design. Offset printing is best left to commercial printers and design professionals. Lithography is the least expensive printing technique and has the fastest turnaround. Oh, letterpress! Where to begin? Hands down, my all time favorite printing technique. Just unbelievably beautiful. Elum Designs, Hello, Lucky and Peculiar Pair Press are among my favorite design studios. Sadly, all that beauty comes at a terrible price (sigh). Letterpress is just about as expensive as you can get. Again, the hand-made nature of the product contributes greatly to it's price tag. Turnaround is typically 4 to 8 weeks. It's totally worth the price. And the wait. The savvy bride can follow the same cost-saving tips as engraving and it should bring the price down a bit. Well, that's it! A crash course in printing. I gave you a lot of info today, so what do you say tomorrow, we go through the pieces in an invitation suite? What's in a traditional wedding stationery suite? Find out tomorrow. As you know, I had been on an impromptu hiatus last week. I apologize, big time. I just needed a little time to do some Bride stuff. I learned a lot last week, and I am really excited to share it with you all. 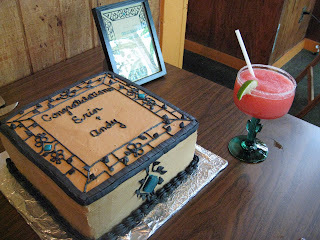 I am currently working on a Flickr page for photos of my Bridal Shower Fiesta. It took me awhile to sift through them all (I ended up with almost 100 pictures...can you believe it?!). But I've decided the page will be live by the end of this week. I also wanted to catch up on thank-you cards and finish some things that I am hand making for the ceremony and reception. I finished a lot. Pictures and design tips, you ask? All this week. I can't wait to show you! One, I think it is very easy for an unsuspecting Bride to be taken advantage of by sneaky wedding vendors. You'd be surprised at the number of wedding professionals who are also conversational wizards. Arm yourself with info and even the most adept monetary assailant is no match for you. Two, the key to any stress-free interaction is the ability to speak the language. Your time will be used most effectively, when you can articulate your vision. Especially if you don't have a planner to speak for you. There can't be any nasty surprises or hurt feelings when everyone is reading the same script, so to speak. OK, so I know I promised you all updates yesterday. You'll have to excuse my tardiness. The Bridal Shower was so much fun! I think it went really well and I really appreciated everything Andy's mom did for me. Everyone got a small favor from Bath and Body Works. I thought it was a really sweet gesture. It was nice for all of the bridesmaids to get to meet one another, kind of a meeting of the tribes, if you will... My MIL had a friend of hers bake this cake to resemble our invitations. I think this was my favorite touch. Traditionally, Brides, you won't have much to do with planning your own showers, but I think this is a good example of choosing a distinctive element of your overall theme and carrying it through. Andy and I received some beautiful gifts from our guests. Mostly kitchenware and picture frames (I got an idea from my Martha Stewart Living that I am dying to try...more on that later). One of my bridesmaids presented me a gift to use just for myself, a gift card to one of the shops in Milwaukee's historic Third Ward. I thought this was a great gift, because it was something special just for me. Personalize notes with reference to the person AND the gift. Every gift should be treated with the same loving spirit in which it was given, regardless of it's worldly/monetary value. Please be enthusiastic when describing the gift, but avoid gushing; don't say anything about a gift you don't mean. Do NOT say thank you electronically. No blog posts, e-mails or e-cards. Not one. For the Recessionista, make your cards out of recycled paper or send messages in postcard form. You may ask that the recipient recycle your card when finished with it. Handwritten notes are a great way to show someone that you took the time to give something back to them. All in all, please use common sense. Do not disclose any disappointment or tell someone you plan to return their gift. Explain how you intend to use monetary gifts; do not just rattle off the dollar amount. No thank you note should ever be perfunctory. When receiving shipped gifts (UPS, FedEX, USPS), the thoughtful bride should telephone or send a small note to the sender, letting them know you've received the gift. 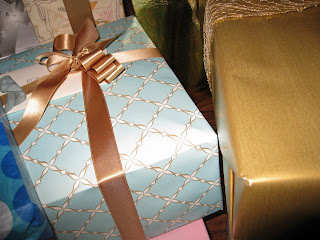 Oftentimes, senders are anxious to make sure their gifts made it to their destination safely. It is polite to let them know BEFORE they have to call and inquire. The most helpful tip I can give the modern bride is to write a few cards each day until you reach your goal. Writing 10 cards a day is much easier than hastily writing them all in one month. Haste makes waste, as they say, and in this day and age waste is anything but stylish. Good Monday, everyone! I hope you all had a super weekend. I did. My Bridal Shower was on Saturday and it was a balmy 33 degrees here in the Cream City. I have so much to tell you, not to mention the fab design tips I've got lined up for you this week. I also realized that there are no pictures, design tips, or details from our wedding plans so far. 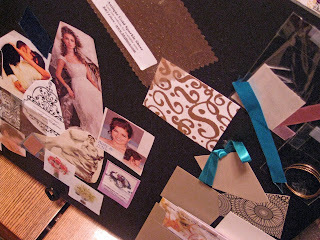 Because I've decided to talk about invitations this week, I'll be using our pieces as examples. I'm so excited to get started!! Ok, ladies, I have been live now for one whole week. Although things are crazy for us right now (42 days and counting!) I wanted to give you a run-down of what we are going to be talking about in the coming week. This week I will be doing my first series. I would like to focus on invitations. We will discuss the printing styles, invitation trends, components of the invitation and the etiquette surrounding it. In conjunction with this, programs and reception paper will also be discussed. As always, I will answer any questions you may have. In what could be considered a side-note, Saturday is my bridal shower (Yay!). My soon to be MIL is throwing it for me. We are having a Mexican Fiesta theme (I thought it was rather festive considering the frigid cold here in Wisconsin). Later in the evening, the 'maids and I will have some quality time out on the town. On Tuesday, I will be sharing pictures and design tips. It is improper to use a three letter monogram on anything that will reach guests before the reception. By this, I mean the combination of the first initials of the bride and groom with the first initial of the new last name. ( in my case, eEa, which signifies Erin and Andrew Ellingen). This rule applies to Save the Date cards, invitations, programs and thank you notes for any gifts received before the wedding. The reasoning behind the rule is fairly simple. No vows have been said. The wedding program is actually the last place the bride's maiden monogram will ever be featured. Opt instead, for the stylish duogram. This combines only the first initials of the bride and groom (e&a). This is the proper way to denote your union with your new spouse. A good design will add a playful air to any printed material. In my opinion, a duogram is especially appropriate on thank you notes for gifts received before the wedding. However, it is absolutely appropriate to use your new, three letter monogram in reception decor. For a more modern twist, try using your monogram as part of the spotlight on the dance floor. Many couples turn it on at the beginning of the first dance. Ask your planner or sound and lighting specialist for details. Other common places are on the cake, menus, and favor tags. If you do incorporate your monogram, be sure to give it an unforgettable debut! 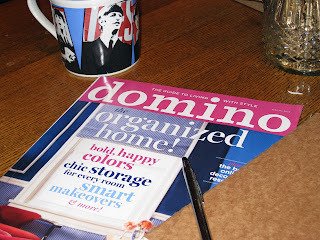 My first issue of my new subscription to Domino Magazine! Oh, holy pinstripes, do I love this publication! This subscription was a birthday gift from my friend and local artist extraordinaire, Allison C. Bielke. Ms. Bielke is a bridesmaid in our wedding and she designed our invitation suite and stationery (I will share designs and details later). It's full of great design tips, especially if you live on a budget. The website is great, too. My favorite feature is their excellent section on party planning. Their ideas have definitely gotten me out of a sticky situation or two. I bring Domino Magazine up, because I think inspiration for your wedding should come from everywhere. I don't believe brides should stick to any one medium when trying to create the perfect event. Your wedding should be as unique as you and your fiance are. We used aspects of architecture, music, fashion, art, hospitality and culture to create something that really personifies who we are as people and to convey that theme to our guests. Design magazines, such as Domino Magazine, can be particularly helpful to the bride who is looking for modern sophistication and style. It is a good source in which to expose yourself to a less traditional palate of color and combination. Am I saying, "Down with wedding magazines!"? Not at all. I used a them a lot and I advise others to take a look at them too, the point I am trying to make is that we don't want to get stuck in a rut. Look to everything for inspiration. For the best results, always make sure to edit. If you have several great ideas, write them all down and then take a break. Come back and revisit them when you feel you are ready to make some decisions. Be sure to stick with the ideas that can help you streamline the overall look of the wedding. Clutter is clutter. Whether it is in your apartment or in your wedding. Taking a few extra minutes to get your thoughts together will definitely help you save money in the long run. Making lists and organizing them will help you learn the difference between what you want and what you want "right now". You will be less apt to get distracted or to make impulsive purchases if you are looking for what you really want. Remember ladies, these days, saving money is stylish. If you are anything like me, the minute you said, "Yes! Of course I'll marry you!" you immediately began thinking about having the "perfect wedding body." I did and I immediately began a new health regimen. From head to toe I decided to transform my body into the magazine bride I always wanted to be. I began restricting my food intake, working out like a mad woman, and taking dietary supplements. Four months went by and I didn't feel any better and I hadn't really gotten any thinner. Then it hit me, what does "having the perfect wedding body" mean to me? What was I actually willing to do in order to get it? I needed to rearrange my thinking. I watch my portion size, count calories and work out five to six times a week. However, I consulted a doctor before doing any of it. This is important, girls. If you want to drastically alter your behavior, please consult a doctor. I learned that if I was going to be working out as much as I wanted, I would actually have to increase my caloric intake. At first I was skeptical. I was taught that if your body feels like its being starved, it will slow down your metabolism, making it harder to lose weight. In addition, I should alternate workouts to give my body time to recuperate and gain the benefit of all the exercise. Try things like yoga (my new favorite thing), pilates, zoomba, and water aerobics to maximize calorie burn while keeping your exercise regimen exciting. For awhile, the only thing I could think about was how I was going to look in my wedding dress. I was making myself feel inadequate, unattractive, and insecure. I was beginning to get lost in the idea of "perfection". This was sucking all of the fun and joy out of planning for the wedding, not to mention the toll it was taking on the other aspects of my life. I began to look for ways to improve my attitude and mental state. I have tried to take more of an interest in myself, to make myself and my feelings more important than my insecurities. We should, all of us, try to be the healthiest versions of ourselves, but sadly, physical health means nothing if we neglect our souls. Try something new today to boost your self esteem and your metabolism. Take a class at your gym (something with a fun title like Yoga Booty Ballet, Cardio Funk or Pi-yo). Or, if you are channeling your inner recessionista, put on your favorite CD (or one that gets you moving) and dance! After one half hour of booty-shaking, you'll be surprised at how much better you feel. Swivel those hips and you'll feel the stress just melt away. Enjoy! I LOVE The White Box of Milwaukee. The White Box is a local wedding planning and consultation service. They have a variety of services tailored for even the most finicky of brides. Absolutely fabulous! Their blog (Bespoke) is even better, chock full of stories, tips and hints that we can all relate to. Whether you're in the MKE area or not, do yourself a favor and check them out! To get enlightened, check out the post here. To get hooked on The White Box, stop by their website. A year ago, when I first started planning this wedding, I was having trouble corralling my ideas and editing them into something I could actually use. I would just cut pictures out of magazines and put them into envelopes. At the end of a week, I had, get this, 45 envelopes FULL of raw ideas. I didn't feel any closer to accomplishing anything, I actually felt as though I had created more work for myself. I needed a change. I needed to view my ideas in an organized way. I also needed some flexibility to allow for the decisions I would surely be making. This is what I came up with. An Inspiration Board. I got the idea from an interior designer friend of mine. She uses them to give clients an inkling of what the larger picture will entail. Brilliant! The one in the picture, I made early on in the process. I started with all of my ideas for dresses, decor, vendors, venues, etc. I arranged them in sections, starting, of course, with the dress and the bouquet. As I toddled along, the boards became more specific, each focusing on one aspect of the planning process. I found this drastically reduced the time I needed to organize my thoughts and I could flip through them, almost like flashcards. As decisions were made, I was able to distill everything into one, cohesive picture. As things began coming together, I made one more board. On it, are the pieces from the other boards as well as some ideas I had along the way. When I finished it, our wedding was staring back at me. Business cards from our vendors, linen samples, the receipt from the deposit on my dress, little pieces that had blended together to become one big, beautiful, idea. This one I will frame and hang as art in my office. I just had to share these with you. These folded note cards are from Chicago-based paperie Snow and Graham. I first learned of this amazing design team during my time with Milwaukee-based stationer, Broadway Paper. These people are geniuses!! Gift wrap, greeting cards, wedding stationery, you name it and this brilliant company has it...even coasters! I would definitely recommend Snow and Graham to any bride looking to add sophisticated style to any aspect of her wedding. 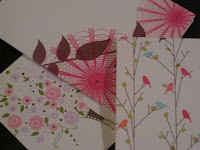 The designs featured here will become thank you cards for attendees of my bridal shower. To add a more personal touch to the often-arduous task of thank-you notes, try short, personalized messages written by hand. If time is what you lack most, printed stock greetings are acceptable as long as you add a thoughtful, personal "PS" section. Your guests love you, so don't be afraid to show them a little love in return. Your friends and family will appreciate the time you took to make them feel special. These luscious, letterpressed cards come boxed, include envelopes and are available in an array of designs. Under Construction and Over the Moon! As you can see, Holy, Matrimony! is under construction. Our wedding is in 51 days, and everything is a little hectic here in Milwaukee. But never fear, dear friends, I will begin posting in a few days. I'm so excited to start sharing with you all! See you soon!